Trinity students rallied in Front Square this afternoon in a call for the government to take action on the future of higher education funding before marching to the Department of Education, with similar protests taking place on college campuses across the country. A coalition, including the Union of Students’ in Ireland (USI), Irish Secondary Schools’ Union (ISSU) and teaching staff trade unions, led the series of “Fund The Future” lunchtime protests, with chants of “when education is under attack, stand up, fight back” and “no ifs, no buts, no education cuts”. Students have pointed to increases in fees from €825 to €3000 over the last decade, cuts to SUSI grants, and reductions in student services as key reasons for the rally. In a statement, Trinity College Dublin Students’ Union (TCDSU) President Shane De Rís outlined the rally is a move to “show that we’re angry, and to show that we demand that the Government fund our future, and the futures of those that will come after us”. “Just last year we rose up when we felt we weren’t being listened to, right now, the Government is actively neglecting the Higher Education Sector, and harming students. We must now stand against this,” said De Rís. Speaking at the rally, TCDSU President-elect and Officer for Students with Disabilities, Laura Beston, outlined how funding cuts impact both access to higher education, and student experience at college. “It’s not just about about funding to get to college, but funding to support us while we’re here,” said Beston. Speaking to Trinity News at the rally, O’Halloran said: “Students are bearing the brunt of the cost of college, fees used to be less than €900 for the academic year and now they’re €3,000. Higher education funding has raised students’ concern since the publication of the Cassells Report in 2016, which detailed three options for how higher education could be funded in Ireland. These included student loans, making higher education free at the point of access with state funding increasing from 64% to 80%, or an entirely state-funded system in which students would receive free education. The government has not yet made a decision on how higher education is to be funded, with no development expected for at least another year as proposals are analysed by the European Commission. Speaking to Trinity News at the rally, TCDSU Education Officer-elect Niamh McCay stated that education “should be affordable to every single person”. “The fact that after Brexit, we are going to have the highest fees in the EU is ridiculous considering Ireland is a strong economic power and, as we can see, the government has the ability to build more hotels, to finance other areas that don’t particularly influence the people of Ireland and the most important people in Ireland are its students, I would argue,” McCay outlined. “I hope that in the light of this our government starts to make some changes or listen to the student voice for the first time in a long time because it can’t happen anymore,” said McCay. “Students must have a sense of ownership over this campaign, it can’t be a series of press launches, public statements or street carnivals like the education marches of previous years. 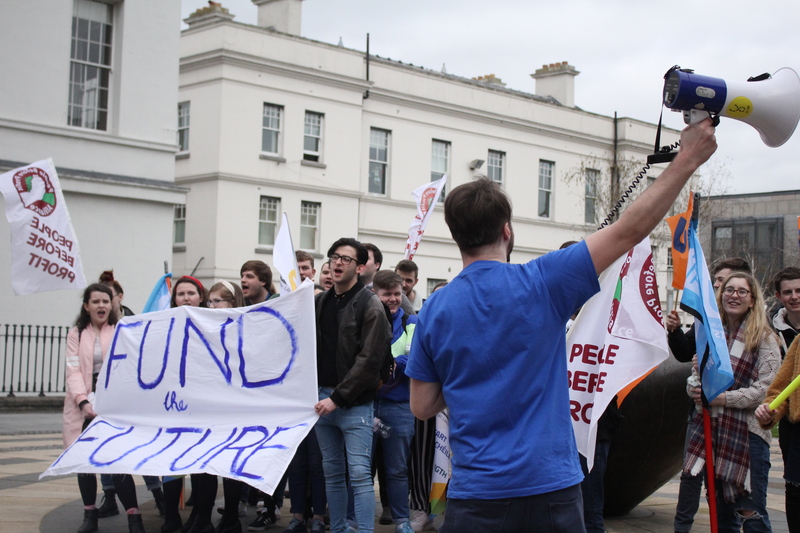 If #FundOurFuture is to mean anything, it must be built on genuine mass student mobilisation and disobedience – people power,” TCD PBP continued. Earlier this month, over 20 students’ union presidents from around the country signed a letter, published by the Irish Times, decrying a student loan scheme in Ireland as “unacceptable”.